Jen Madigan Photography - Mentor, Ohio Lifestyle Photographer: Where's Einstein? When I say that Einstein is only 4 lbs, I think people still have a hard time visualizing just how small that really is because 9 times out of 10 the first thing they say when meeting him is "he's SO tiny!!". Truly, he is a little peanut (although don't tell him that!). Sometimes at night after we get home from work he likes to drag out all of his toys and then lay down in the middle of them, and there's been more than one occasion where I will look over and think "where's Einstein?" (much like Where's Waldo). 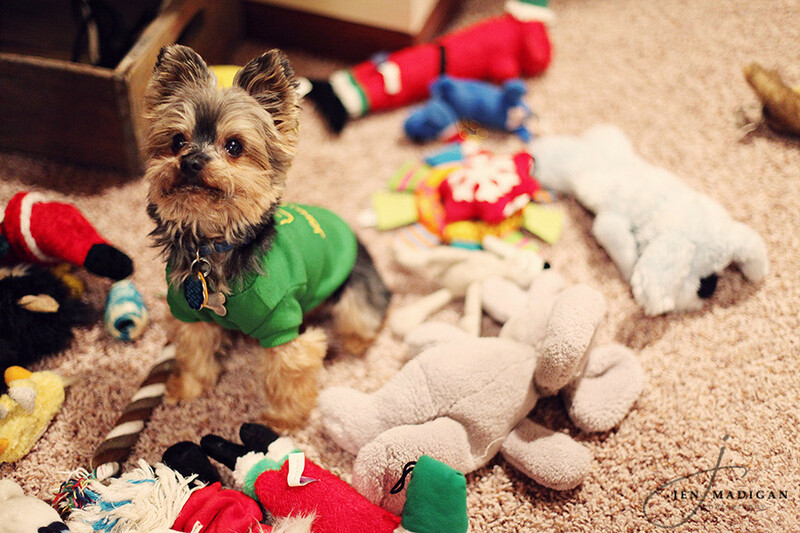 As you can see by the photo above, he's about the same size as most of his toys so they make the perfect hide out for a little dog needing a break after a long day at work. If you are thinking of doing a session (family, engagement, etc) this spring/summer, please book early! You can email me at madiganphotography@gmail.com for more information.